By 1940 the unit had successfully manned all the Forts under their command. 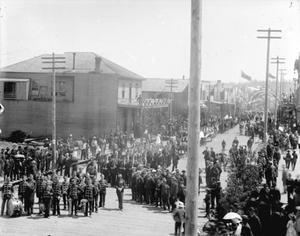 Personnel were transferred on a six month rotation through Yorke Island and this year witnessed the first Battery exchange, 31 Heavy Battery, RCA from Point Grey exchanging with 85th Heavy Battery on Yorke Island. Authority to organize the 15th (Vancouver) Coast Brigade, RCA, NPAM was given on 12 July 1940. The unit was to be formed as a 2nd Brigade of the 15th (Vancouver) Coast Brigade, RCA, and to have the same establishment. This called for 18 Officers and 328 Other Ranks together with a chaplain and M.O. attached. 1st Anti-Aircraft Regiment, RCA was redesignated: '1st (Reserve) Anti-Aircraft Regiment, RCA' on 7 November 1940. In the 1930's the mainland companies of the old 5th B.C.B.G.A. were remembered with nostalgia. "The boys of the old brigade" held reunions in1937, 1938 and 1940 and exchanged memories of comrades and youthful escapades. Some stories grew with retelling: a former powder-boy of the Seymour Battery, in successive accounts of his enlistment, pushed the date farther and farther back into the mists of antiquity. "Remember when the sergeant bawled us out for carrying umbrellas while wearing the Queen's uniform?" asked one ex-gunner of his fellows in 1940. In the light of the Boer War and the two world conflicts that followed, those days in the 1890's when the men of Vancouver and New Westminster paraded in gaudy uniforms and fought mock battles in which no one died seemed like the innocence of childhood. The Regimental Museum has digitized some old films. This is possibly 5th Medium Bty of 15th (Vancouver) Coast Brigade RCA, training in 1940. The film may be reversed as evidenced by the "D" on the vehicle front and the figures on the backs of the gun numbers. The location is unknown. Check out the video and see if you can identify some of the missing info! 0:18 - The Gun Tractors move out. What vehicle is this?Note the reversed "D"
0:32 - Prepare for Action? Are the Gunners exercising the recoil? 0:38 - The Detachment Commanders lead the guns into the position. 0:40 - What was thrown to the Detachment Commander? 0:54 - The detachment now wear numbers on their backs. What do you think was the purpose of this? 0:58 - Halt! Action Rear! 1:03 - All the members are wearing coveralls with numbers except the one Sergeant. Is he the Regular Force Instructor? Is this a gun numbers course? 1:06 - The gun is unhooked. 1:08 - The limber is unhooked. 1:15 - Why we don't walk backwards while moving guns and limbers! 1:21 - Angles passed from the Director. 1:40 - Ammunition is distributed. 1:43 - The Command Post setup. 2:07 - The first round fired. 2:39 - Primer fairly struck! 2:55 - The impact area. Does anyone recognize the terrain?